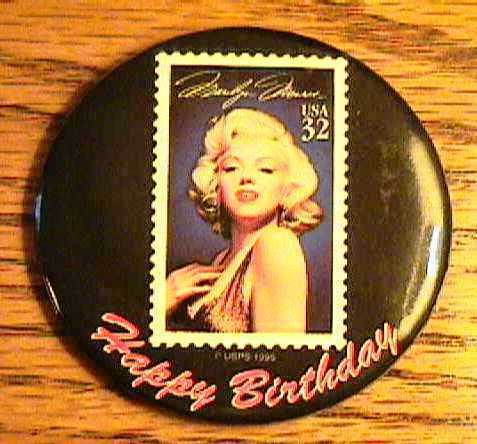 Home » roundaboutrecords' booth » Marilyn Monroe Large Button 32 Cent Stamp 2 1/2"
Marilyn Monroe Large Button 32 Cent Stamp 2 1/2"
Thissale is for a Large Marilyn Monroe Button. It has a picture of her on a 32 cent stamp and says Happy Birthday! on the front. This button measures 2 1/2" in diameter. This button is in mint condition. I have had this button in my collection for many years. It has never been worn or used. SEE THE MANY OTHER GREAT ITEMS I HAVE IN MY STORE!